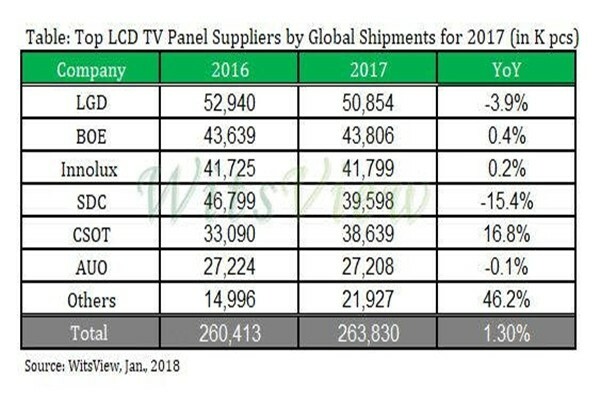 LG Display and Samsung Display maintained their first and second places respectively based on a ranking on amount of areas of LCD TV panels that they shipped in 2017. However based on amount of shipment of LCD TV panels, China’s BOE surpassed Samsung Display and has taken the second place for the first time. According to a market research company called IHS Market, LG Display and Samsung Display shipped out 31,914,458 m2 of LCD TV panels and 25,657,259 m2 of LCD TV panels respectively in 2017. Innolux (18,805,577 m2), CSOT (16,295,872 m2), AUO (16,093,761 m2), and BOE (15,942,049 m2) followed LG Display and Samsung Display. On the other hand, based on calculation of amount of shipment of LCD TV panels in 2017 done by a market research company called TrendForce WitsView, BOE has taken the second place for the first time. According to WitsView’s analysis, LG Display shipped out 50.85 million TV panels in 2017 that is 3.9% lower than the amount of TV panels it shipped out in 2016 and was able to maintain the first place. BOE’s shipment of LCD TV panels increased from 43.63 million in 2016 to 43.80 million in 2017 and it saw 0.4% increase. Innolux, which was in fourth place in 2016, shipped out 41.79 million LCD TV panels that is 0.2% increase from 2016 and rose to third place. Samsung Display saw its amount of shipment decrease by 15.4% from 46.79 million in 2016 to 39.59 million in 2017 and went down to fourth place. Reason why there is so much discrepancy on these rankings is because BOE is still focusing on production of medium-sized panels such as 32-inch and 43-inch panels. On the other hand, Witsview is estimating that amount of shipment of LCD TV panels in 2018 will be the second highest ever in history. It is estimating that 269.49 million panels will be shipped in 2018 that accounts for 2.2% increase from 2017.